Chicago musical melting pot The Claudettes are hitting the road to kickstart an extensive 2018 touring slate, and they are doing so here in Columbus! 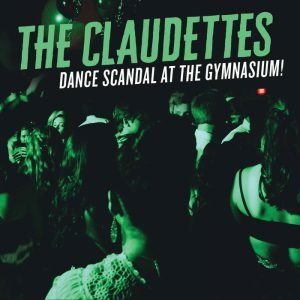 The Claudettes play Natalie’s on Wednesday, April 4th at 9pm – tickets and more info are available here. The quartet, said to “fuse Chicago piano blues with the full-throttle energy of rockabilly and punk and the sultriness of ’60s soul,” is made up of pianist/founder Johnny Iguana, singer Berit Ulseth, bassist/singer Zach Verdoorn and drummer Matt Torre. Their concert is an Album Release Show for their new album DANCE SCANDAL AT THE GYMNASIUM! that was produced by Mark Neill (producer of Black Keys’ Brothers plus albums by Old 97’s, Los Straitjackets, J.D. McPherson and more) and released on March 23rd. Iguana and I had a great chat about the creation of that album and much more ahead of a previous visit – revisit that interview here. Keep reading for my thoughts on the album, and get ready for a rollicking Wednesday night show! The band’s mash-up of styles, moods, eras and influences, with plenty of offbeat humor and social commentary in the mix, results in work that is hard to describe but usually rather easy to enjoy. Ulseth coolly warns a potential suitor that it’s not going to work on “Don’t Stay With Me,” with help from Iguana’s detailed and pounding piano lines and Verdoorn’s hazy guitar. Pulsating keys are a reliable and appealing hallmark of The Claudettes’ sound – Iguana leads the way on “Give It All Up For Good” with full force, and therefore creates instant contrast when he backs off, letting Ulseth craft her commentary on the perils of social media overexposure. “Naked On The Internet” lightheartedly covers similar ground, lamenting our leaders’ loss of privacy while having a rocking good time, with the piano licks bringing to mind Ray Charles. The alternating lead vocals on the tender “Pull Closer To Me” effectively paint an intimate relationship while the rhythm section dials it back until drama builds to the conclusion. Perpendicular piano lines open the title track before one driving lead holds sway, and transitions bring guitar pyrotechnics and cooing background vocals on the mostly instrumental tune. “Bill Played Saxophone” places plenty of political social commentary atop a catchy backbeat, and is pretty fun whether or not you want to dig into the current state of the nation. The subdued “Death and Traffic” is a downcast look at the pain that fills the news, and Ulseth’s simple but emotive vocal echoes the feelings of many in this day and age. “Taco Night Material” illuminates the potential downsides of marital routines, and Iguana’s dramatic cascading lines give body to the humorous but quickly escalating tale. “Utterly Absurd” comments on today’s instant information, and the emphatic delivery of Iguana’s rhythms and Verdoorn’s half of the vocals are an appropriately dramatic method to close the proceedings.